Moanin’ this morning. This take is amazing. Morgan’s got a sound like hot buttered rum here, and Thigpen (one of my very favorite drummers) is almost gutbucket on the snare, loose limbed and utterly unBlakey. Listen to Lee Morgan on the head, though, like he wrote the thing. Hard to believe this was over half a century ago and the players long gone, it’s still so vital, like you could just head uptown tonight and hear it again. Old film opens up jazz like a time capsule, and if you close your eyes for a minute you’re there. Lee Morgan and Ed Thigpen. 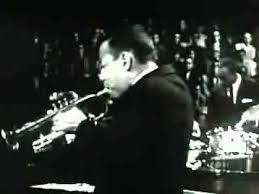 This entry was posted in Jazz and tagged Ed Thigpen, Lee Morgan. Bookmark the permalink.